Holidaymakers spreading sunscreen too thinly on their skin may be giving themselves less than half the protection needed, a new study has shown. The research looked at DNA damage from ultraviolet (UV) rays in the skin of test volunteers at different levels of sunscreen thickness. Results reveal that cream loses much of its effectiveness if applied below the recommended thickness of two milligrams per square centimetre of skin (2mg/cm2). That is the thickness level recommended by manufacturers, and what sun protection factor (SPF) ratings are based on, but users are known to be far less liberal when applying. Lead researcher Professor Antony Young, from King's College London, said: "There is no dispute that sunscreen provides important protection against the cancer-causing impact of the sun's ultraviolet rays. "However, what this research shows is that the way sunscreen is applied plays an important role in determining how effective it is. "Given that most people don't use sunscreens as tested by manufacturers, it's better for people to use a much higher SPF than they think is necessary." 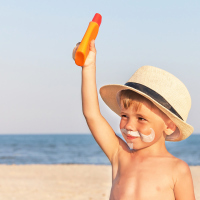 Previous studies suggest that sunscreen is typically spread as thinly as 0.8mg/cm2 but the new study showed that at this level of usage a sunscreen with a high SPF of 50 would at best provide 40% expected protection. Biopsy tissue samples showed that repeated UV exposure caused "considerable" DNA damage to unprotected skin areas, even when the radiation dose was very low. The study comes as the UK gears up for its hottest days of the year so far, with temperatures expected to top 34C at the end of the week as the summer heatwave continues. If you're living with skin cancer and are looking for travel insurance that meets your needs, have a look at our dedicated cancer travel insurance and give yourself peace of mind before you head away.